With a progressive world sound that embodies all the qualities that make world music so enjoyable, 3-time JUNO nominees, and 3-time CFMA winning ambassadors of musical diversity Sultans of String have expanded the traditional notion of Christmas music with their new, genre-hopping album, Christmas Caravan. Recorded and co-produced with JUNO Award winning engineer John ‘Beetle’ Bailey, this isn’t your typical holiday album. You may recognize a few titles, but you’ve never experienced seasonal music quite like this before. The guest artist include: 6-time Grammy winning Paddy Moloney (The Chieftains), Ruben Blades & Luba Mason (Panamanian 7 Grammy and 5 Latin Grammy winner), platinum-selling jazz vocalist Nikki Yanofsky; 2-time JUNO/Grammy winner Alex Cuba; Benoit Bourque of Quebec’s La Bottine Souriante (3 JUNOs, 4 gold, 3 platinum records); Sweet Honey in the Rock (Grammy winning, all-woman, African-American a cappella group); Cameroon’s Richard Bona (Paul Simon, Herbie Hancock, Mike Stern); Canada’s singer to the stars Rebecca Campbell (Emmylou Harris, Alanis Morissette); singer Mary Fahl from NYC’s October Project; a recording collective of Turkish Roma violinists in Istanbul; Sudanese-Canadian singer Waleed Abdulhamid; Nashville-based JUNO Award winning country singer Crystal Shawanda; sitar virtuoso Anwar Khurshid; and hang drum player David Charrier from France. Excellent music in every sense of the word, that’s the short of it! The album does a great job of balancing the honored tradition of each track, while still conveying diverse cultural sounds, colors and rhythms to make the music soar. The playing is top-notch, and with the inclusion of singers such as Rebecca Campbell (who does a beautiful version of “Little Drummer Boy”), or Nikki Yanofsky (who takes on the classic “The Christmas Song” and makes it her own) you have a winner. 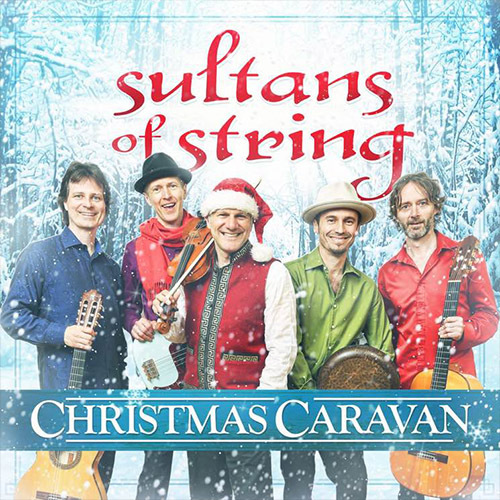 As one would expect, the Sultans of String bring you songs from multiple cultures that celebrate Christmas, Kwanzaa, and Hanukkah. The result is, everyone will dig this album, period. The stocking roster on this album is stuffed with luminaries guests on most songs that is perfect music for a gathering of young and old. With a strong message of love for humankind running through the eighteen-song album, good cheer will be abundant while Christmas Caravan is playing. Each track is a gem of styles and sounds that make world music magical, but the Sultans of String certainly put their own unique sound on each track, and that makes them even better! Excellent album.